Masters running – the division into age groups and age-graded performances – has become more competitive in recent years. And those who come out on top are often the ones who slow down the least with progressing age—or don’t seem to slow down at all. Age group records are broken regularly by those who took up running in their 30s. In this article, you will learn how to stay fast beyond age 35. Outstanding performances in long-distance running are possible between the ages of 15 and 55. The 5K world record for M50 is 14:53min and the MRA record for M50 stands at 2:19:29h. Chances are, you don’t know anybody in their 20s (other than aspiring Olympians) who can achieve those times. While this is exceptional, it is comforting to know that it is possible to stay fast – very fast. In general, however, peak performance occurs at age 25 – 35 and from then onwards it’s a decline of 0.8% per year on average. But the rate at which that happens is largely due to lifestyle and in particular training habits. Whereas non-athletes slow by 1% per year the most committed of runners can cut it to 0.5%. That is a considerable advantage as most races are divided into age groups. While it is inevitable to stop aging altogether, running by itself is the perfect sport to stay young for longer. A recent study compared the biological age of people with different activity profiles. As it turned out, little exercise won’t cut it. You will have to work out regularly at high levels. If you don’t run daily, consider the addition of cross training to your non-running days. When it comes to staying fast, the 4 things that distinguish younger runners from masters are the ability to recover, flexibility, the elasticity of heart and muscles, and neuromuscular recruitment. This, of course, is partly dependent on genetics. Nevertheless, a masters runner who pays attention to detail and trains wisely is not necessarily at a disadvantage with a runner in his 20s. If you’re above age 40, you may consider getting rid of all ‘junk miles’ and focus on the 4 key training runs per week. That way you have 3 times 48h per week where your body can absorb the training stimulus. Apart from overtraining, it will also reduce the likelihood of an injury to occur. I recommend the same 4-day/week regimen for rather heavy athletes and fast-twitch runners. It’s also important to note that your ability to recover is largely dependent on your testosterone and growth hormone levels. These hormones can be elevated with anaerobic training. A strength training regimen with heavy weights (5 – 6 repetitions per set) elevates testosterone. Anaerobic cross training – such as boxing or swim sprints – is well-suited to upregulate growth hormone levels. Another important variable to ‘keep alive’ is neuromuscular recruitment. The reason masters lose speed isn’t the loss of muscle tissue. The problem is the loss of motor units (the muscle-nerve connection) that innervates the contraction of muscles. That can be minimized with a weekly track session. But at the very least I recommend including a few sprints during your easy runs. Flexibility and elasticity are also age-related. A lack of it leads to a less powerful and economical stride, which results in slower race results. Again, this can be countered with sprint repetitions, dynamic drills, plyometrics, and regular stretching. Make it a habit to incorporate each element into to your running sessions. This should always be preceded by a 5 – 10min warm-up jog. In summary: Masters running training is not very different from high-school running training. But you will have to schedule more recovery time between hard sessions, remove junk miles, and add activities that keep your hormones at youthful levels. 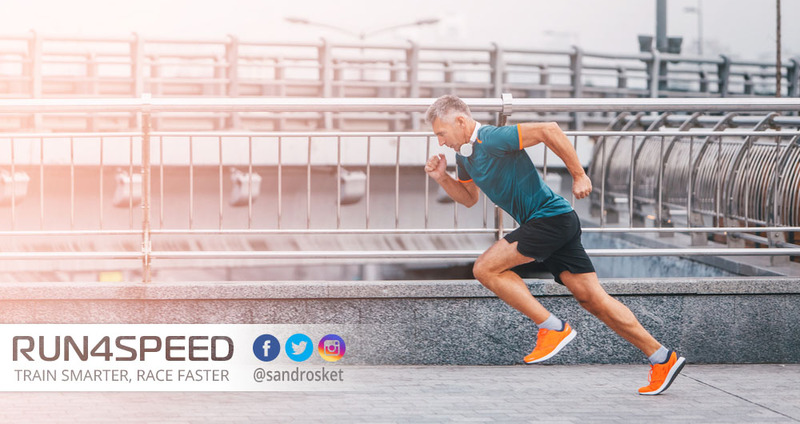 What’s more, you will have to include neuromuscular training such as sprint repetitions and plyometrics to keep your speed. And don’t skip stretching after runs. NSCA-Certified Strength & Conditioning Specialist. Coach to competitive runners. Training plans for competitive runners of all levels who want to improve their race results from the 5K to the marathon. Step 1: Select your race distance, goal, problem, and weeks until your event. Step 2: Fill out the basic athlete profile you will be linked to after your purchase. Step 3: Receive an email from me within 24h to discuss your customization. Step 4: Receive your custom plan, train intelligently, and succeed on race day. RUN4SPEED - Training plans and coaching for competitive runners of all levels. © 2013 - 2019 RUN4SPEED - All rights reserved. Free 14-day trial of any training plan!